Be the first to share your favorite memory, photo or story of Lilah. This memorial page is dedicated for family, friends and future generations to celebrate the life of their loved one. 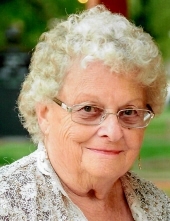 Lilah J. Highlan, 80, of Valparaiso, Indiana, passed away peacefully at 8:30 a.m., Saturday, April 6, 2019 at her daughter’s home in Rochester. On May 5, 1938 in Michigan City, Indiana she was born to George and Opal (Isaac) Snyder. Lilah retired as a Processor from Indiana General. She loved garage sales and Goodwill, touching everything! Lilah enjoyed dancing, gardening, and push mowing the grass. On May 5, 1956, she married the love of her life, Ralph Highlan, that preceded her in death October 8, 2008. Also preceding in death are her parents, and one sister, Mona Williams. Surviving are three children, Jan (Louis) Rich, Kim (Mike) Camplan, and Jeff Highlan; four grandchildren, Becky (David) Lautt, Ryan (Angie) Rich, Michael Camplan, and Stefanie (John) Flanagin; eight great grand kids, one great-great granddaughter on the way; seven siblings, Karen Girard, Connie (Richard) Shay, Georgie Romans, Lorrie Clark, Valerie (Keith) Williams, John (Terri) Snyder, and Pete (Yvonne) “Bonnie” Snyder. A funeral celebrating her life will be held at 11 a.m., Thursday, April 11, 2019, at Graceland Cemetery, 1505 East Morthland Drive, Valparaiso, Indiana 46383 with Pastor Todd Wilson officiating. Visitation and viewing will be held from 10 a.m. until the time of service at the cemetery chapel. Burial will be in Graceland Cemetery. To send flowers or a remembrance gift to the family of Lilah Highlan, please visit our Tribute Store. "Email Address" would like to share the life celebration of Lilah Highlan. Click on the "link" to go to share a favorite memory or leave a condolence message for the family.